1st -4th pressing SOLD OUT! 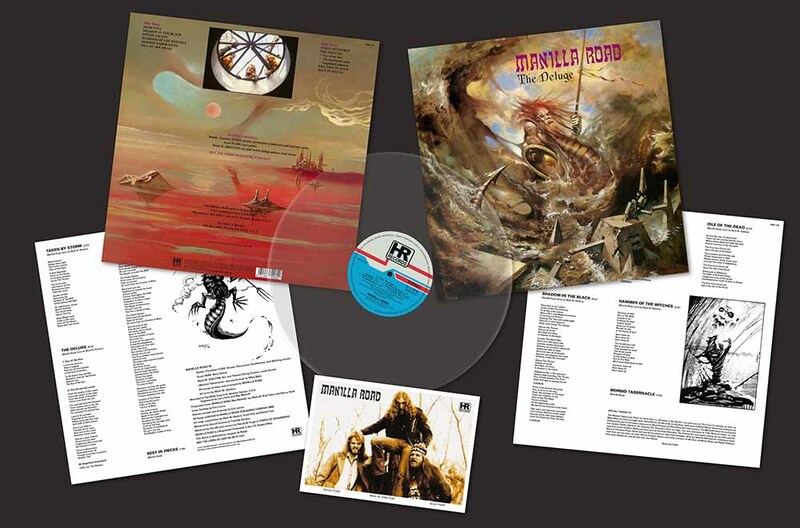 With "The Deluge" (originally released on Black Dragon Reords in 1986) High Roller Records is kick-starting a campaign to re-release the whole Manilla Road back catalogue on vinyl. "The Deluge" was a very important album in the history of the mighty Manilla Road. Mark "The Shark" Shelton travels back in time: "It was, at the time of its release, the most intricate and complex project that Manilla Road had ever done. The production was better than any of our previous releases and the musicianship was also. 'Open The Gates' had been very successful for us and we were riding high at the time. It was maybe one of the most fun albums to record back in that era. We were all brothers in arms and the world was there for our taking and that's exactly what we tried to do with 'The Deluge': take over the world. I think every aspect of the band was coming together for us very nicely at that time and with all the good feelings about ourselves it was not much of a surprise to us that the album turned out really good. 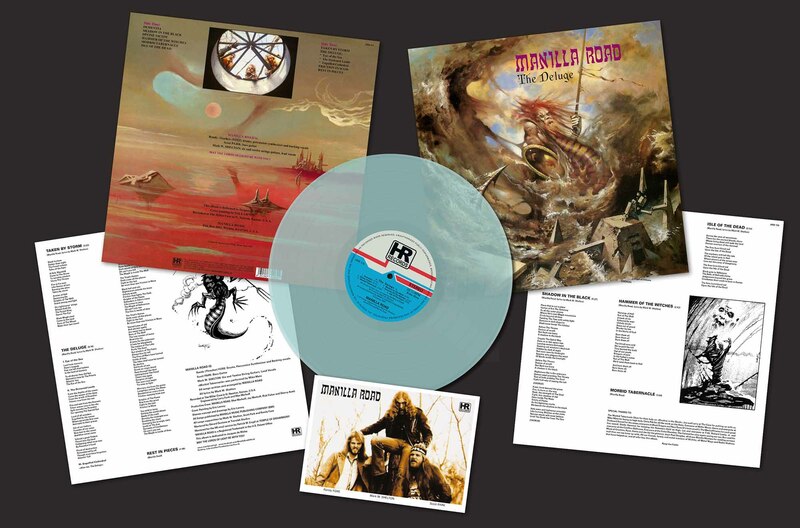 As for the albums that we did after that, 'The Deluge' helped set a higher standard for production and musicianship as well as the composition. It also lead us lyrically into even more historical realms than we had ever traversed before. More literary topics and lyrics and it also helped set the pace for how much research we put into a project. After 'The Deluge' we continued to work more and more in the framework of literature, art and philosophy meets Heavy Metal. I think 'The Deluge' was our first really big step towards becoming a truly epic band." "The Deluge" was released in 1986 on the French Black Dragon label (and never saw an offcicial US release up to the present day). According to Mark, it was a very successful album for Manilla Road: "It sold very well at the time. Of course there were no CD's yet and so the free download did not exist either. So everyone that wanted to have 'The Deluge' had to purchase it. Our relationship with Black Dragon was really good at that time. It was not till years later that we had differences that could not be settled." With songs like "Friction In Mass" and "Rest In Pieces" the album contained some of the fastest songs the band had ever recorded until that point in their history. The title track "The Deluge" was actually a prelude to a later song called "Atlantis Rising". Mark explains: "Yes, that is correct. I did not really intend for there to be a sequel to 'The Deluge' when I wrote it back in 1985 and 1986. It just sort of happened when we were coming into what we call the reformation period for the band. That is from 2000 on. It seemed like a good topic and way for the band to come back into the scene. 'Atlantis Rising' showed everyone that we still meant business and that epic was still what Manilla Road was about. I guess a good story just keeps telling itself." Even in hindsight, Mark Shelton is pretty satsified with the production values of "The Deluge": "Yes. Especially for the time. There was not much digital recording going on yet and for us it was a big leap in production quality. We actually did not use that much in the way of studio effects on that album. We kept everything as close to how the band was sounding live at the time. To this day I am still adamant about using real drums and not samples or triggers. I don't use loop technology either. We perform everything that is on our albums. Even the weird stuff." The original cover artwork of "The Deluge" was absolutely brilliant. That was always one of the main strengths of the band: "It was done by Eric Larnoy (RIP) who passed away a few years after he did that cover. It was painted in oil and acrylics on a huge slab of wood. It was remarkable to look at. 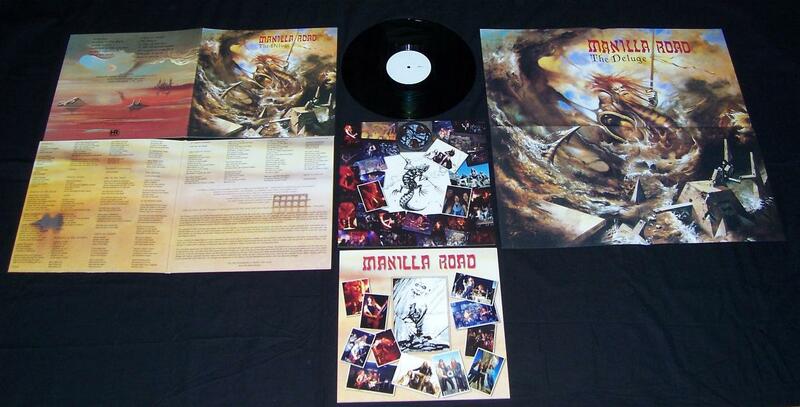 One of my favourite Manilla Road album covers, it is. I hung out with Eric in Paris, France in 1986. He was really cool and I got to see his art studio and of course the original painting of 'The Deluge'. I offered unheard of amounts of money for the painting but he told me it was his favourite piece out of all the art he had done and could not part with it. He took me to Jim Morison's grave and showed me some of the sites around his home town in France. I'm really lucky that I had the chance to get to know him. Unfortunately, he died of illness just a couple of years later. The cover art for 'The Deluge' won best cover art of 1986 in France." No wonder at all, I think. 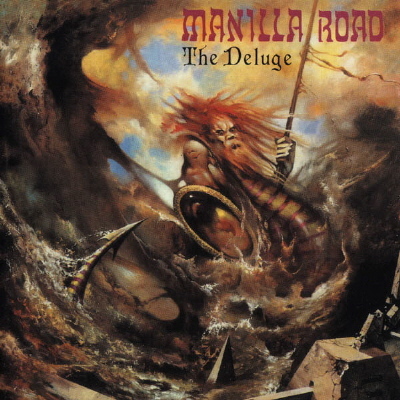 "The Deluge", as all the earlier Manilla Road albums, was not well received in the mainstream Metal press at all. Mark explains: "France loved it. Maybe because we were on a French label at the time. Most of Europe I think liked 'The Deluge' but to be honest the only mag that was really promoting us heavy at the time was Enfer from France, Iron Pages and a few other smaller mags. It took many years of mags ridiculing us for one reason or another before we were widely accepted in Europe." This supports my argument that nearly all music journalists did not get what Manilla Road was all about right throughout the 80's. The press only started to get behind the band when a new generation of young fans hailed their name durting the last ten to 15 years. Mark agrees: " You are not far from wrong there my friend. As I stated, most of the mags were hammering us with things like Shark's voice is too nasally or they are the ugliest band in Rock or it sounds like Satanic dirge. Yeah, we put up with a lot of bad press from most of the major magazines for a long time. And you are correct that it was not until 2000 that our popularity really began to sore in Europe. And it is so cool to see that we have a whole new age of fan base starting to pop up all over the world. I must say also that Manilla Road has the most dedicated fans in the world. We would not still be here doing this if not for them. 'Up The Hammers', my friends." Up until "The Deluge" was released in 1986 Manilla Road had not been playing a single gig in Europe. Mark confirms: "That is correct. We had not even done that much touring in the States yet either. I did go to Europe to visit with the label and check out the scene in Europe in 1986. Unfortunately, we did not have any connections with promoters back then and neither did the label. So we were sort of just stuck playing in the local tour circuit around the mid-west of the US until we did 'Mystification' when we took off on a couple of tour trips across the central and northeastern United States." 1986 was the year when Thrash Metal was starting to get really big, the big four, Megadeth, Metallica, Anthrax and Slayer, were beginning to become mainstream. Was that the kind of stuff Mark Shelton was listening to at the time? Shark: "I have always had a very eclectic taste in music. I like most everything as long as it is striving to be art. I was an early Metallica fan and became a Slayer fan after they put out 'Reign In Blood'. I have been a Judas Priest fan since 'Sad Wings Of Destiny' and I have always listened to old Black Sabbath and Rush along with loads of other bands. During the 80's I was really into European Metal. I mean all sorts of bands ranging from Hawkwind to Axe Witch. I'm a huge Candlemass and Angel Witch fan. Hell, I was listening to everything: Iron Maiden, Michael Schenker, Scorpions, Pink Floyd, Motörhead … you know the list is going to be a mile long and it still would not have all the bands that I was listening to at that time." 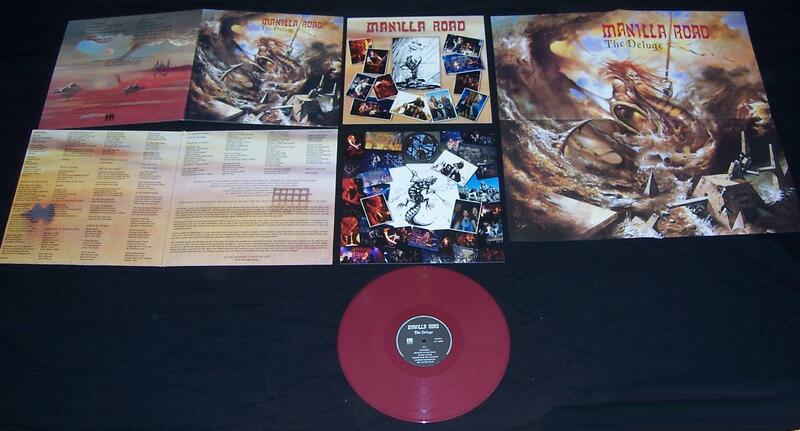 As Manilla Road have been going 32 years since they released their debut album "Invasion" on Roadster Records in 1979, there surely must have been a time when Mark thought of throwing in the towel. That was surely the case: "Yes. I hate to say it but when Randy and Scott had all their problems with each other and the group broke apart after the recording of 'Courts Of Chaos' I was ready to throw in the towel. But it was Bryan Hellroadie Patrick that set me straight and reminded me that this was why I was put on the earth and that I could not betray the muse by stopping the music. 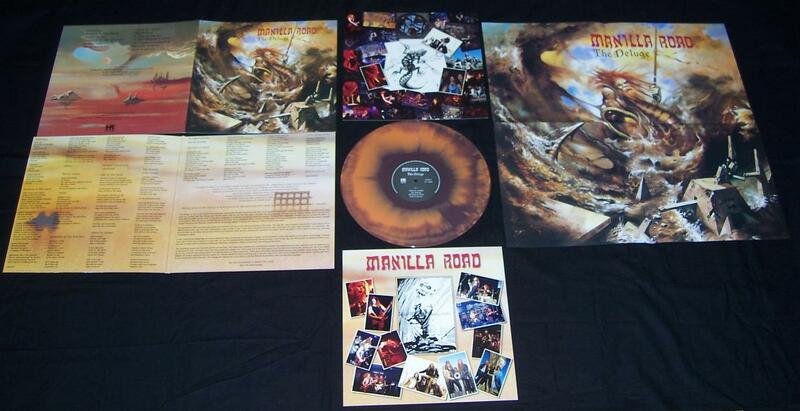 So we all have Hellroadie to thank for Manilla Road still being around and still creating epic music. I could not have done all this without him. He is a true Brethren of The Hammer. And so are our fans because it was them that caused enough commotion about Manilla Road to make labels and promoters take a chance on working with us. Thanks to all of you and: 'May The Lords Of Light Be With You All.'"